Within one month, the United States has experienced two sides of the same coin. Hurricane Harvey hit Texas and Louisiana. It was an unprecedented event due to the heavy rainfall. Some areas experienced more than 40 inches of rain in less than 48 hours, while other areas had more than 50 inches of rainfall– a record for a storm in the contiguous United States1. Harvey was also unprecedented in its exposure since it flooded almost all of Houston –the fourth largest city in the United States. Record dry conditions and record breaking heat triggered 76 active wildfires in nine Western states: Montana, Oregon, California, Washington, Idaho, Colorado, Nevada, Utah and Wyoming2. Combined, these wildfires burnt 8 million acres this year –or about the combined land area of Connecticut, the District of Columbia and New Jersey3. After devastating the United States Virgin Islands as a catastrophic category 5 hurricane, Irma hit Florida as a category 4 hurricane. It sustained winds of 185 mph for more than 36 hours, placing it as the strongest hurricane on record globally4. After severely damaging and destroying Florida, Irma became a tropical storm, bringing strong winds, heavy rain, flash flooding and storm surge flooding to Georgia, North Carolina and South Carolina as well as affecting Mississippi, Alabama and Tennessee5. Puerto Rico suffered significant damage from Maria, a category 4 hurricane. Parts of the island received 40 inches of rain, causing widespread flooding6. These extreme weather events, which happened in August and September 2017, are indicators of climate change. Weather events are the result of natural factors. For example, there are hot days in the summer and there is rainfall everywhere in the world. Weather events, however, are also influenced by human-induced climate change. The changing climate has altered their intensity and/or frequency in a substantial and measurable manner. These include heat waves, droughts, wildfires, and severe storms (or heavy precipitation) and hurricanes (or tropical cyclones) –both of which lead to flooding7 8. These weather events influenced by human-induced climate change are happening all over the United States. They are becoming more frequent and intense. They are also becoming more costly. The facts are crystal clear. 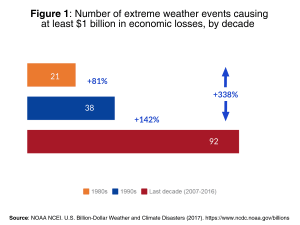 The number of extreme weather events causing at least $1 billion in economic losses have increased from 21 in the 1980s and 38 in the 1990s to 92 in the last decade (2007-2016) –a more than a two-fold increase compared to the 1990s and more than a four-fold increase compared to the 1980s9 (Figure 1). The number of severe storms experienced the most significant increase in the last decade, with more than a four-fold increase compared to the 1990s. Drought events have almost doubled in number in the last decade, compared to the 1980s and 1990s. 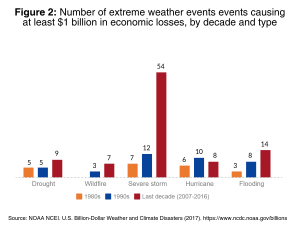 As a result of severe storms and hurricanes, flooding events in the last decade increased by almost a two-fold compared to the 1990s (Figure 2). 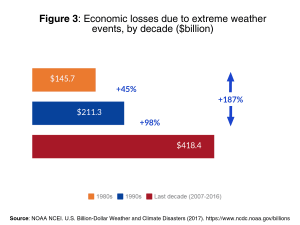 The cost from these weather events influenced by human-induced climate change, with at least $1 billion each in economic losses and damages, have significantly escalated from $145.7 billion in the 1980s and $211.3 billion in the 1990s to $418.4 billion in the last decade –a two-fold increase compared to the 1990s and an almost three-fold increase, compared to the 1980s10 (Figure 3). Hurricanes caused the most economic losses in the last decade, with $144.6 billion, compared to $97 billion and $36.1 billion in the 1990s and 1980s respectively. 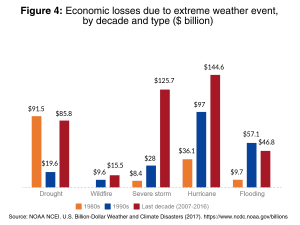 The most significant increase in economic losses and damages, however, are from severe storms, which experienced a more than a four-fold increase in the last decade compared to the 1990s (Figure 4). The rising trend continued in the 2000-2006 period, with $377 billion in economic losses and damages from 31 extreme weather events. The most costly event in that period was hurricane Katrina which caused $160 billion 11 in economic losses, affecting Louisiana, Mississippi, Alabama and Florida in August 200512. Economic losses from extreme weather events are rapidly escalating. The economic losses of hurricanes Harvey, Irma and Maria and the wildfires in the nine Western states combined could be as high as the aggregate economic losses from the 92 events in the last decade13. Agricultural production in the United States is highly dependent on rain. In 2012, only six percent of all farmland was irrigated14. Drought, thus, affects crop output impacting food availability and driving up food price for consumers. It also affects farmers’ livelihoods. Since 2012, American farmers in California, Texas, Oregon, Washington, Idaho, Montana and New Mexico have lost crops on hundreds of thousands of acres, due to the persistent drought. Within the last five years, livelihoods of farmers in these states were impacted with $56 billion in economic losses15. If action to address climate change is not taken, the production of corn and soybean –the largest crops in the United States— could experience a 20 to 30 percent decrease within the next three decade16. This could potentially cost corn and soybean producers losses of $17 to $25 billion a year17. Louisiana is one of the states where the highest number of flooding events happened in the last decade as a result of severe storms or hurricanes. In August 2016, 30 inches of rain fell in a few days, flooding southern Louisiana –a 1 in 500 year event. More than 50,000 homes, 100,000 vehicles and 20,000 businesses were damaged or destroyed. The economic losses due to the floods in Louisiana were $10 billion18. Some 75 percent of those affected by this record rainfall were uninsured19. Many individuals, families and businesses lost everything due to extreme weather events, such as the one in Louisiana. So did those Americans affected by the severe flooding in Colorado in 2013, or by Superstorm Sandy in New York and New Jersey in 2012 or by the wildfire in California nearly each year. • Drought: California (8, with no billion dollar drought events in the 1990s or 1980s), Idaho (7, with no billion dollar drought events in the 1990s), Oregon and New Mexico (6, a six-fold increase compared to the 1990s), Oklahoma (6, a two-fold increase compared to the 1990s), Kansas (6, a three-fold compared to the 1990s) and Texas (6, a three-fold increase compared to the 1990s). • Wildfire: California (6, a two-fold increase compared to the 1990s), Arizona and Oregon (6, a six-fold increase compared to the 1990s), Idaho (6, with no billion dollar wildfire events in the 1990s or 1980s), Texas, Nevada, Washington and Colorado (5 each, a five-fold increase compared to the 1990s) and Montana (5, with no billion dollar wildfire events in the 1990s). • Severe storm: Texas (32, a more than a four-fold increase compared to the 1990s), Kansas (24, a six-fold increase compared to the 1990s), Oklahoma and Illinois (23 each, a more than a four-fold and almost a six-fold increase compared to the 1990s, respectively) and Missouri (21, a more than a five-fold increase compared to the 1990s) and Tennessee (18, a more than a four-fold increase compared to the 1990s). 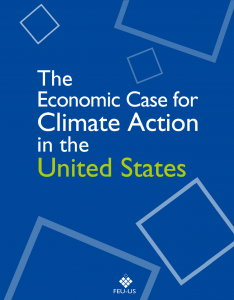 • Hurricane: Alabama, Louisiana and Virginia (4 each, a two-fold increase compared to the 1980s); Pennsylvania, New York, Maryland and Connecticut (3 each, a 50 percent increase compared to the 1990s); North Carolina (3); and Mississippi and New Jersey (3 each, a three-fold increase compared to the 1990s). • Flooding, as a result of severe storms and hurricanes: Louisiana and Missouri (4 each, a four-fold increase compared to the 1990s); Texas (3); and Arkansas, Illinois, Indiana, Kansas and Iowa (3 each, a three-fold increase compared to the 1990s). See the interactive maps showing the increasing frequency of billion dollar events has impacted each state in the 1980s, 1990s and the last decade (2007-2016).